No matter where you install it, the Olympic wood insert takes center stage as a leading attraction. The Olympic is Avalon’s largest wood burning insert. Designed to fit most masonry fireplaces, this unit heats up to 2,500 square feet, making it ideal for larger homes and living spaces. 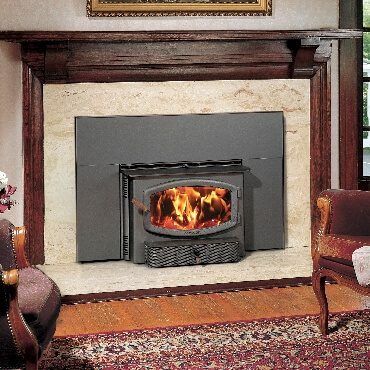 Its huge firebox offers longer burns, giving you more time to relax and enjoy the flames. A standard bypass damper ensures an easy starting fire and smokeless refueling. This insert can be installed recessed into the fireplace opening or extended onto the hearth for additional radiant heating and a handy cook-top surface. The Olympic produces only 2.6 grams of emissions per hour, making it one of the cleanest burning large wood inserts ever tested and certified by the EPA.